Pool Marvel® does for your pool what Spa Marvel® does for your hot tub. The All Natural Pool Marvel formula has been carefully developed to work in conjunction with all other pool chemical systems to enhance their performance and reduce overall maintenance in a swimming pool environment. 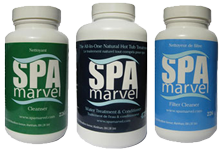 Spa Marvel is an Eco-friendly and enzyme based spa water product that reduces and eliminates the need for many chemicals used in traditional spa water treatment.